Is it too early to start dreaming up holiday menus? If so, please know that it was an accident, I swear. 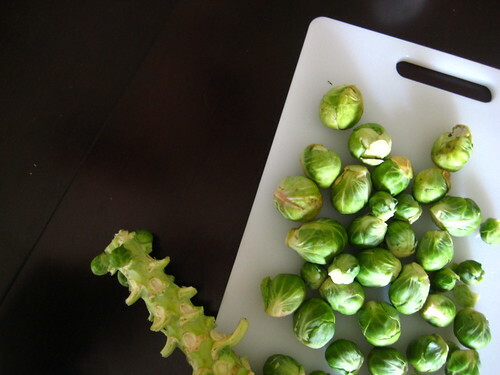 It all started with these Brussels sprouts at the farmers market. I've come to realize that come fall, my inspiration to cook slows down a notch, hence my silence around these parts lately. In the summer, when the farmers markets are loaded with colorful new-to-me vegetables every week, it's almost a bit overwhelming. Once September hits, everyone freaks out about the apples and pumpkins. Except me. I have no desire to cook anything with apples or pumpkins. Sorry. 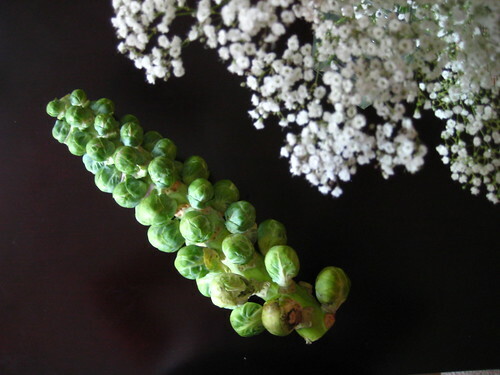 So thank goodness for these Brussels sprouts and the thick stalk they grew on. They looked so odd and straight-from-the-earth, I just couldn't resist. Of course, my first thought was to drizzle them with olive oil and lemon and roast them -- my simple go-to that has gone from simple to just plain boring. I couldn't show up here with another lemony roasted vegetable. 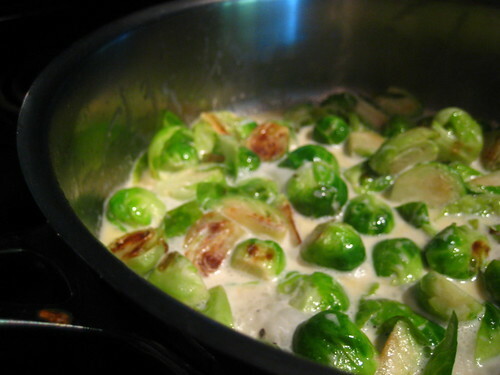 So I turned to Molly of Orangette and, lo and behold, she had the recipe for me: Cream-braised Brussels sprouts. 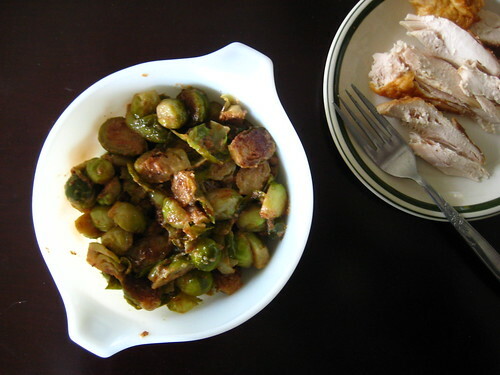 This recipe is meant as a side dish to accompany a large bird or ham or other meat to be eaten during the holidays, and let me tell you -- once those Brussels sprouts were simmering in cream on the stove, my apartment filled with the smell of Thanksgiving. 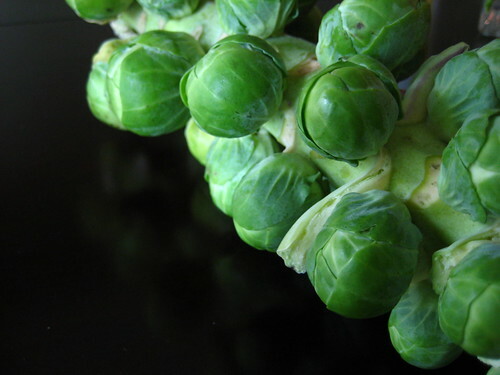 The sprouts had become layers of soft, creamy blankets, and when I took my first few bites, I couldn't help but imagine swimming in a bed of quilts and pillows and having to eat my way out. Forget waiting for the holidays. A dish like this is welcome anytime -- even a rainy, windy Saturday afternoon in October, with nothing to serve it with but leftover chicken, and nothing much to celebrate besides the simplicity and comfort of it all. Oh, how lovely, and what a perfect way to come back to us. I don't know if I've ever even had Brussels sprouts, but now I want to. Jacqui, So glad you're back! We are brussels sprouts fans, and I have been roasting them for years (my recipe inspired by the Barefoot Contessa). I can't wait to try your version. Thanks! shanna - you should try them! they're like mini cabbages. mrs. p - i still want to try roasting them because although this dish is delicious (and makes really good leftovers), it's extremely rich. be sure not to make it alongside anything too heavy! I love brussels sprouts and with all the creme these look amazing! I can't wait until the holidays to try this one! Cinnamon apple cake. For breakfast. Walking and eating: Chicago Food Planet Tour. Working, whisking, and creamy mac-and-cheese. Last day. First egg in a nest.